Boophone haemanthoides is a summer-flowering geophyte growing up to 500 mm tall. It looks very much like a primitive plant with at least two thirds of its massive scaly bulb visible above ground. Some of the largest bulbs can be more than a hundred years old! Figure 1. Large bulbs showing thick layers of papery tunics of Boophone haemanthoides subsp. ernesti-ruschii (Photo: Hendrik van Zijl). This deciduous, winter-growing geophyte grows from a massive, egg-shaped bulb surrounded by thick layers of grey or brown, papery outer tunics. A great deal of the bulb can be seen above ground. It produces a spreading fan of up to 20, strap-shaped, intensely glaucous (grey-green) leaves, produced in 2 opposite rows. The leaf surfaces are flat or slightly to deeply channelled, and the leaf margins vary considerably from straight to slightly or strongly wavy. The dense, brush-like umbel (flower head) emerges from the centre of the bulb from early to mid-summer, after the leaves have died back. The umbel is enclosed by 2 oval-shaped bracts, and is carried on a thick, maroon, pinkish brown or yellow stem which is strongly compressed. The sweet-scented flowers are actinomorphic (regular), with straight perianth tubes, and the erect or spreading tepals are more or less linear, and initially white, cream-coloured or light yellow, ageing to dull pink. The stamens protrude strongly, and have pink or light yellow filaments, with maroon or cream-coloured unripe anthers. Initially, the flower stalks are erect or suberect during the flowering stage, then radiate and lengthen substantially during the fruiting stage, to form a spherical infructescence (fruiting head). The ripe fruit is a strongly 3-angled, papery capsule, containing 1 to several, round, fleshy seeds, which are covered with a thin corky layer. The basic chromosome number is x = 11. Boophone haemanthoides comprises 2 subspecies: subsp. haemanthoides, and subsp. ernesti-ruschii (Dinter & G.M.Schulze) G.D.Duncan & C.C.Tsang. The subsp. ernesti-ruschii differs from subsp. haemanthoides in having relatively small bracts, shorter tepals which are spreading at peak flowering stage (instead of erect), shorter filaments, cream-coloured unripe anthers (instead of maroon), and a later flowering period (mid-December to February, instead of late October to early December), and an inland distribution instead of a coastal one. Considerable variation occurs in leaf margin morphology of subsp. ernesti-ruschii, from straight to slightly or strongly wavy, and this variation sometimes occurs within the same population (Duncan et al. 2016). This species is assessed as Least Concern (LC) on the Red List of South African Plants website, which indicates that it is considered at low risk of extinction, because of its widespread distribution. However, due to the cultivation of large areas of land, many of these plants have been lost. Farmers and landowners have a key role to play when it comes to the conservation of these beautiful and unusual plants. Figure 7. Boophone haemanthoides subsp. ernesti-ruschii flowering among dolerite stones (Photo: Hendrik van Zijl). 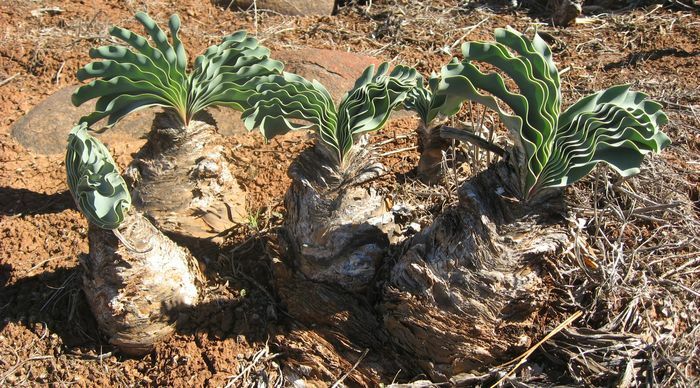 Booophone haemanthoides occurs from southwestern Namibia to the Cape west coast, and inland to the Roggeveld Mountains in the western Great Karoo. The subsp. haemanthoides has a coastal distribution from Hondeklip Bay in southwestern Namaqualand to Churchhaven, growing mainly in deep sands and on limestone flats, rarely on granite outcrops, in several vegetation types, including Saldanha Flats Strandveld and Namaqualand Strandveld. The subsp. 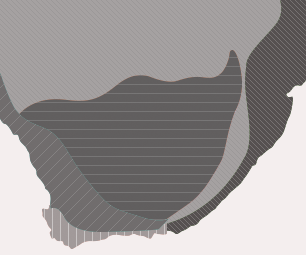 ernesti-ruschii has a much wider, inland distribution, from southwestern Namibia to the Richtersveld, eastern Namaqualand, Bokkeveld Plateau, eastern Cederberg and Roggeveld Plateau. It is associated with steep, rocky mountain slopes and ravines, rocky outcrops and flats, in numerous vegetation types, including Nieuwoudtville-Roggeveld Dolerite Renosterveld and Swartruggens Quartzite Karoo. In the northern parts of its range, this subspecies occurs in exceptionally arid conditions, where droughts may span several years, and in the Roggeveld, the plants often experience sub-zero temperatures in winter. Both subspecies are usually encountered in colonies, although solitary, widely isolated specimens also occur. B. haemanthoides is suited to cultivation in full sun. The subsp. haemanthoides requires a frost-free environment, but the subsp. ernesti-ruschii can take light to moderate frost. Figure 8. Leaf fans of Boophone haemanthoides subsp. ernesti-ruschii (Photo: Hendrik van Zijl). The earliest illustration of a boophone is by the Dutch nurseryman, Emanuel Sweerts (1552–1612), who produced an engraving of the plant now known as Boophone haemanthoides, depicting a mature bulb in leaf, on plate 67 of his Florilegium amplissimum et selectissimum, published in Frankfurt in 1612. 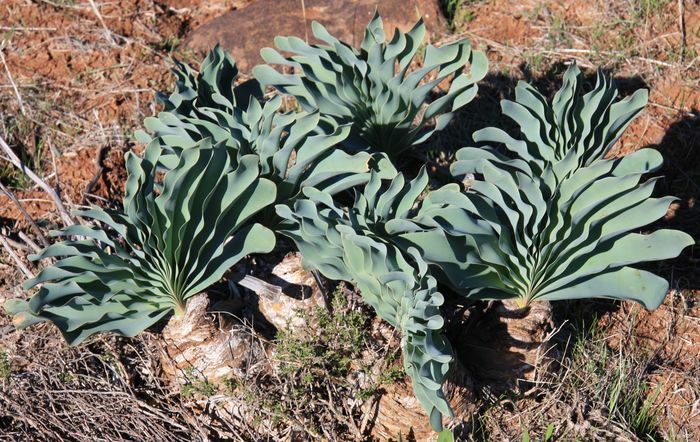 The plant was formally described more than 300 years later by the South African botanist Frances M. Leighton (Mrs Isaac), who worked in the Bolus Herbarium at the University of Cape Town. Her description was made from material collected west of Piketberg by her botanist colleague, Louisa Bolus, and appeared in volume 13 of the Journal of South African Botany, in 1947. The specific name haemanthoides describes the dense, brush-like flowerhead, which is similar to that of Haemanthus. The subspecific name ernesti-ruschii commemorates the German farmer in Namibia, Ernst J. Rusch (1867–1957), who collected the type material in southwestern Namibia. The subspecies ernesti-ruschii was originally described as Boophone disticha var. ernesti-ruschii by M.K. Dinter and G.M. Schulze in 1941, and transferred to B. haemanthoides by G.D. Duncan and C.C. Tsang, in 2016. The genus Boophone was established by the English botanist William Herbert in 1821. It is derived from the Greek bous (an ox), and phone (death), and is descriptive of the poisonous properties of the plant, capable of killing an ox. 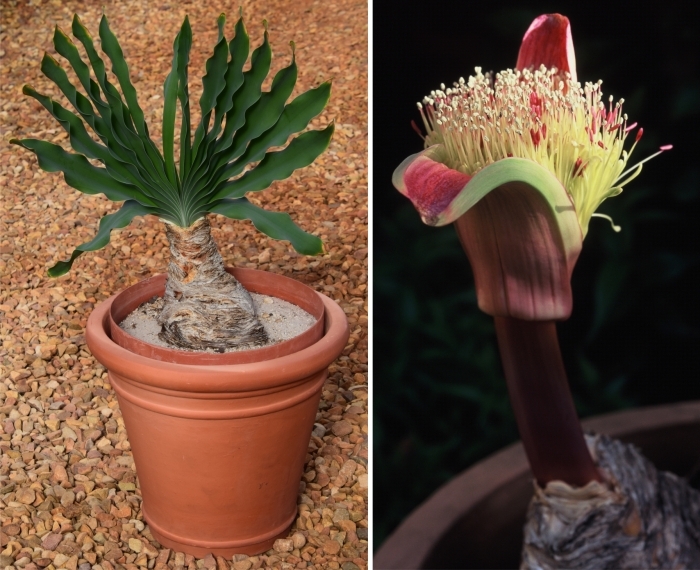 Boophone is widely distributed in sub-Saharan Africa, from the southern Cape in South Africa to South Sudan, and comprises 2 species, B. disticha and B. haemanthoides. The most widespread and variable one is B. disticha, which occurs throughout southern Africa and extends into tropical Africa. It is a mainly summer-growing species, but also comprises winter-growing forms in parts of its range, such as in the southwestern and southern Cape, and southwestern Namibia. It is distinguished from B. haemanthoides by its widely spreading flowerhead of bright pink, pinkish red or red flowers with narrowly lance-shaped tepals; by its relatively narrow spathe bracts with acute tips; and by its narrower leaves with acute tips. The summer-growing forms of B. disticha are dormant in winter and flower mainly from July to October, and those from winter-rainfall areas are dormant in summer and flower from February to April. Boophone bulbs are often partially or sometimes fully exposed. Boophone flowers are superficially similar to those of Crossyne. Crossyne flowers differ in their smaller, irregular shape (divisible into equal halves in one plane only), shorter perianth tubes and tepals, and the ripe fruiting head detaches at the base of the peduncle, not at the top. In addition, Crossyne has subterranean bulbs and strap-shaped, prostrate or spreading leaves, with the margins fringed with straight bristles. Boophone haemanthoides is a deciduous, winter-growing geophyte adapted to cool, moist winters, and hot, dry summers. New leaves appear in late autumn, elongate rapidly in winter, and die back in late spring. Depending on the subspecies, flowering takes place from late October to February, either directly after the leaves have withered, or up until late summer. Individual flowers are short-lived, lasting only a few days. The flower head lasts no more than 1 week, and the pedicels (flower stalks) elongate rapidly thereafter and become rigid, forming a spherical fruiting head (infructescence) of numerous capsules. Fleshy, round seeds develop within the capsules, and when ripe, their expanding size ruptures the capsule walls, and some of them drop to the ground. The ripe fruiting head later breaks off at the top of the peduncle (flower head stem) and is tumbled away by wind, ensuring that the remaining seeds are dispersed far and wide. As the seed heads often come to rest when blown against fences, large numbers of plants are often found growing along fences. The seeds are covered with a thin corky layer, which protects them during the hot summer months, until favourable conditions for germination return in autumn. The thick layers of papery tunics surrounding the bulb provide protection from scorching summer heat during the dormant period. Little is known of the pollination biology of B. haemanthoides, but it is visited by bees and flies, which are attracted to the frangipani-scented flowers. The flowers are also visited by ants. The developing flower buds of both subspecies are eaten by the Koppie Foam Grasshopper (Dictyophorus spumans). Boophone haemanthoides has no magical uses, but 8 alkaloids (naturally occurring, toxic compounds) have been identified in this species. Among these, isolates of lycorine and distichamine showed strong activity against leukaemia, breast cancer and cervical cancer (Nair et al. 2013). B. haemanthoides is occasionally used as a subject for large containers, rock gardens and conservatory displays by specialist bulb growers. Figure 10. Boophone haemanthoides subsp. haemanthoides as a container subject (Photo: Graham Duncan). Boophone haemanthoides is a striking plant for a large pot, and also makes a handsome feature planted in bold groups in rock garden pockets. It is important to note that the bulbs are highly sensitive to excess moisture during the winter growing period, and require a completely dry summer period when they are dormant. The plants do not survive for long outdoors when planted in high rainfall areas, such as in the southern suburbs of Cape Town, but do well in the drier northern suburbs. The plants require high light intensity to grow well, preferring full sun for as much of the day as possible. A pot at least 400 mm deep is needed for a mature bulb. When displayed as a pot subject, it performs well when placed on a sunny patio. Grow the bulbs in a sandy, well-drained soil mixture, such as equal parts of washed industrial sand and river sand. Place a thick layer of stone or bark chips at the base of the container to improve drainage, and a layer of well-rotted compost over the chips, and fill up the rest of the container with the sandy mixture. When planting B. haemanthoides bulbs, make sure that at least two thirds of the bulb is above ground level. Water the plant well once in late autumn, and wait for the leaves to appear. Thereafter, provide a good soaking once per month. As soon as the leaves start to turn yellow in late spring, withhold watering and keep the bulbs as dry as possible in summer. In cultivation, flowering can be very erratic, and the main display feature of these plants lies in their ornamental leaf fans. Individual flowers are short-lived, lasting only a few days, and the flower head lasts no more than 7 days. The subsp. ernesti-ruschii can tolerate moderate frost for short periods, but the subsp. haemanthoides requires protection. Propagation is mainly by seed, as offsets rarely, if ever, form in cultivation. Remove the seeds once they start to rupture the seed capsules, and sow them immediately into deep pots, in a sandy medium, covering the seeds lightly with about 3 mm of the sandy medium, and keep the medium dry for the summer months: the corky layer surrounding the seeds will prevent them from drying out. Some of the seeds may germinate immediately, or germination may be delayed until early autumn, at which time, monthly watering can begin. At the end of the first spring, withhold water and allow the seedlings to go dormant. Growing this species from seed requires extreme patience, as maturity may only be reached upwards of ten years. Apart from koppie foam grasshoppers which eat the developing flower buds, this species is seldom subject to attack by insects. The leaves are sometimes eaten by the European brown garden snail (Cornu aspersa), which can transmit viral disease. Insufficiently well-drained soil, and watering during the dormant period, inevitably result in rapid fungal rotting of the bulbs. Duncan, G. 1980. Skaars inheemse plante van die Saldanha-Langebaan veld. Veld & Flora 66(2): 49–51. Duncan, G., Jeppe, B. & Voigt, L. 2016. The Amaryllidaceae of southern Africa. Umdaus Press, Pretoria. Low, B. 2001. Boophone haemanthoides. Veld & Flora 87(2): 64–66. Manning, J. & Goldblatt, P. 2007. Nieuwoudtville: Bokkeveld Plateau & Hantam. South African Wild flower Guide 9. Botanical Society of South Africa in association with the National Botanical Institute, Cape Town. Nair, J.J., Rárová, L., Strnad, M., Bastida, J. & Van Staden, J. 2013. Alkaloids from Boophone haemanthoides (Amaryllidaceae). Natural Product Communications 8(12): 1705–1710. Tsang, D. 1998. Boophone ernestii-ruschii, a living diamond in south-western Namibia. Herbertia 53: 145–151. Acknowledgments: The authors thank Hendrik van Zijl for the use of his images: figures 1, 2, 3, 4, 5, 7 and 8.